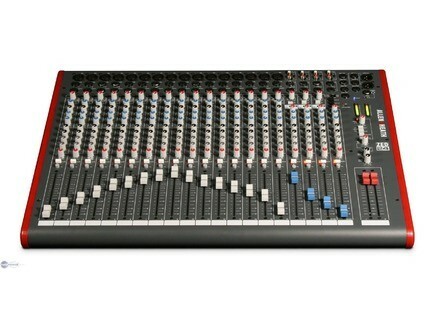 ZED-24, FireWire/USB/mLan Mixer from Allen & Heath in the ZED series. Allen & Heath will unveil the ZED 24, the latest addition to their ZED range of small USB-equipped mixers, at the 2008 edtion of the Winter NAMM show. The new ZED 24 stereo mixer will basically be an expanded version of the ZED 14, with 16 mono channels, 4 stereo channels, 10 independent outputs, 4 aux sends (2 pre and 2 post fade), a USB send and return (for PC / Mac recording, playback and effects), a dual stereo input capability (the 4 stereo channels will all have the ability to take additional stereo inputs from phono sockets or from the USB audio input) and advanced monitoring facilities. The ZED 24 also features a 3-band swept-mid EQ and the new Allen & Heath DuoPre™ pre-amps on the mono channels. ZED's USB output can be configured to allow different signals to be sent to USB, from the LR master, the matrix or the aux busses, with the USB return signal available as a stereo return. The mixers are bundled with Cakewalk's SONAR LE music production software, for live performance, live recording, studio recording, or studio mixing. The NAMM show will also be the official debut for the ZED 4 bus series : ZED-420, ZED-428 and ZED-436 mixers. For more information, visit the ZED range mini web site.